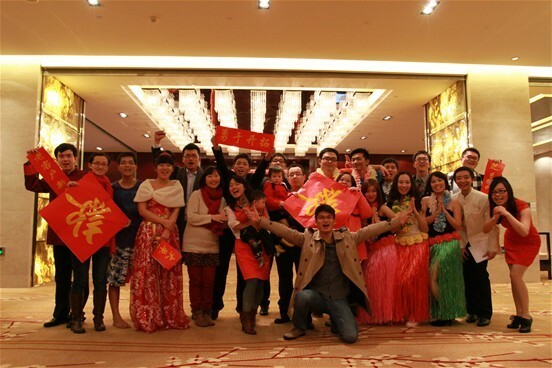 Recently, the 2012 Shanghai Zenith's annual meeting had a perfect curtain call. In the theatrical performances of annual meeting, all of the departments have presented one by one colorful, exciting, and full of creative programs. One of the most warm program was song skewer "I love my family" brought about by Zenith World Trade Center. The program of "I love my family" is presented in four chapters of headquarters, new employees, offices, and family. The unity and vitality of Zenith is fully demonstrated in front of the audience by adapting the familiar songs and dances. When the little babies were held to the stage by Moms and Dads, and co-sang "I love my family", the audiences were suddenly impressed by the warm atmosphere of the stage. The responsible person said in the mobilization meeting: "Team is our source of confidence." Shanghai Zenith has been the team culture of unity and harmony, close to a family. In the New Year, Zenith will continue to promote teamwork, and strive to provide customers with quality products and friendly, professional service.